Keeping on with Unwound this week, this is the Rat Conspiracy box set from Numero Group. Like its predecessor Kid Is Gone, Rat Conspiracy documents another time specific chunk of Unwound and fills up 3 LPs worth of greatness. This era of Unwound is probably my favorite and it's where I first checked in on the band when I was a kid. The first LP is the 2nd full length that Unwound recorded, but the first one to actually be released; Fake Train. Unwound really took form on this album. While still retaining the energy and aggression of some of their earlier work, Fake Train jettisoned some of the extreme noise that Unwound had been playing with in favor of a slightly more structured take on their music. Don't get me wrong, there's plenty of yelling, feedback and squall, but this time the band seems to have more of a purpose. The 2nd LP is the full length New Plastic Ideas. This was always my favorite Unwound record. The sound is more refined, but the band still has some gnarled freak outs to keep things interesting. In reading the massive liner notes for this box set, I was surprised that the general consensus from the band is that people didn't really like this album and thought it was boring. I never got that vibe back when it was originally released and I sure don't see that now with 20 years of hindsight. In my opinion these are the best Unwound songs aside from a little slice of joy that leads of the 3rd album in this set. The 3rd and final disc of this box set compiles a bunch of 7", compilation and other assorted tracks. 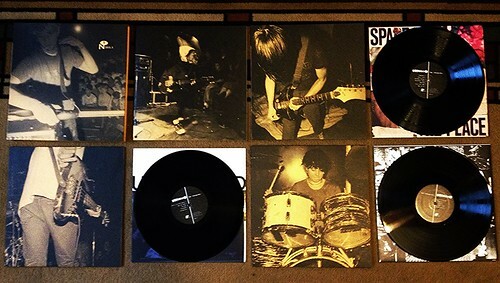 The odds and ends of this era of Unwound. The first song on here is "Broken E Strings." This is the first Unwound song I ever heard as it originally appeared on the Jabberjaw compilation in 1994. Not only is it the first song that I heard from the band, it stands the test of time as being their very best. The gentle verse, with minor guitar parts and rhythmic drumming careens into the blown out screaming chorus. As a high school kid hearing this for the first time I was pretty blown away. The rest of the songs on the 3rd LP are also strong. This was a time that Unwound was really firing on all cylinders. The next box set that comes out will be interesting for me. It's going to contain the albums that many point to as the band's best, but it also starts off the era of Unwound that I wasn't following that closely as I was moving on to different things at the time. I'm curious to see if those songs just can't hold up to these earlier recordings or if I just blew it when I was younger. We'll see in a few months.